Taking pictures with iPad becomes more and more popular and common since the iPad is made to be more slim and light by Apple. While it brings us more fun for our daily life, it also makes us more worried about losing data from iPad. Just imagine if you have taken some photos with your family or friends for some important events, such as the wedding ceremony, birthday party, etc with your iPad, but finally you just lost all those photos due to wrong deletion, iPad loss or iPad damage and so on. That would be totally annoying since those photos are priceless memories for you. Can it be possible to recover deleted photos on iPad? 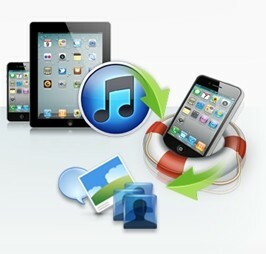 You can be relaxed if you have made a previous backup of your iPad with iTunes. 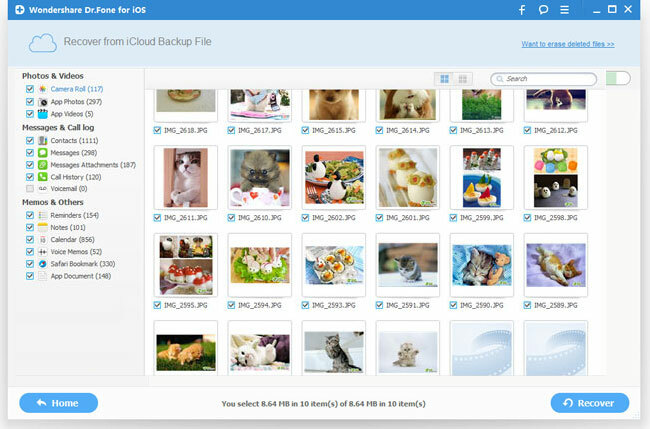 Because you can easily restore the photos from iTunes backup. But it will become more difficult if you don't have an iPad backup in iTunes. Yes, here it's said "difficult" instead of "impossible", that's simply mean it can be recovered possibly. Actually even if you didn't make iPad backup before, iTunes will automatically back up your iPad and make those files unreadable so that you can't have access to them. Generally speaking, even though you deleted the photos or other data from iPad, you can retrieve the deleted photos in some way. 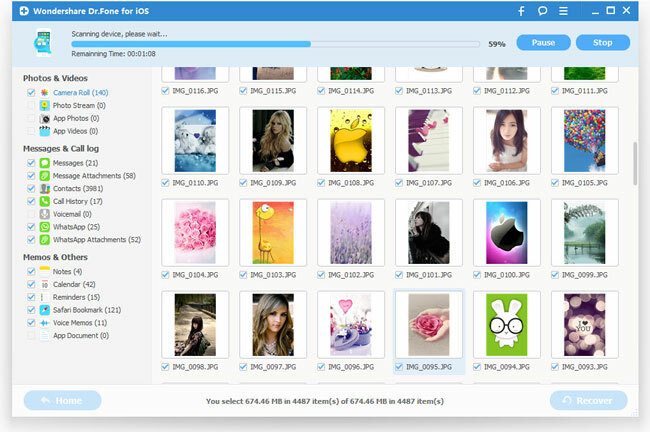 And here the way, and also the Only way to recover deleted photos from iPad, is to use third-party iPad data recovery tool. What is iPad data recovery and what can it do? iPad Data Recovery is specially designed to recover deleted photos and all other types of data from iPad and other iOS devices, such as iPhone and iPod touch. Whether you are using the latest iPad air, iPad mini with retina display or new iPad, iPad with retina display, iPad 2 or even iPad 1, iPad Data Recovery is able to help you retrieve all your lost photos in a few seconds. There are totally 3 ways to recover lost photos from iPad with iPad Data Recovery: recovering from iPad directly, recovering from iTunes backup and recovering from iCloud backup. The following tutorial will guide you to recover your deleted photos from iPad in details. Connect your iPad to computer after launching the program. Then it will begin to detect your iPad automatically as the window shown below. 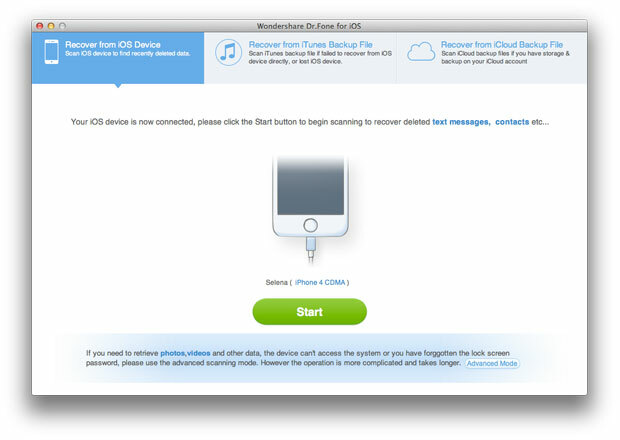 Click "Start" button on the window to let the iPad data recovery program begin scanning your iPad. After scanning, you can see all found files in categories as below. Then you can choose the deleted photos you want to recover and restore them by clicking "Recover" button. Note: Both deleted files and those still on your iPad will be found and displayed after these steps. If you only want to get your deleted files back, you can refine the scan result by using the slide button at bottom to "Only display deleted items". 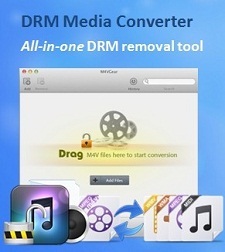 Run iPad Data Recovery and choose the recovery mode as "Recover data from iTunes backup files". Note: Do not connect and sync your iPad with iTunes during the progress, or your iTunes backup will be updated and your previous data will be overwritten and unrestorable. 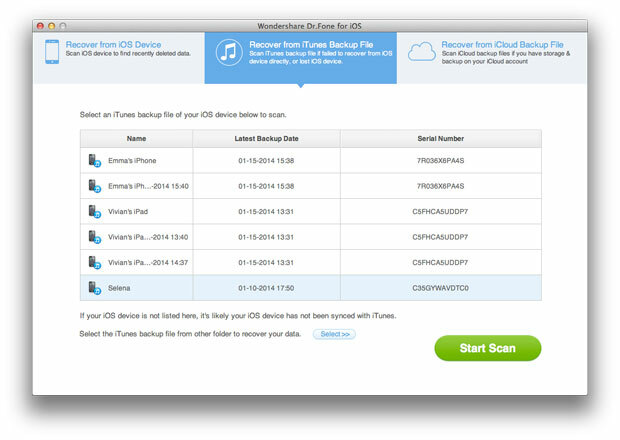 All the iTunes backups will be detected and displayed according to the recent backup date. Select the wanted backup file records and start to scan by clicking "Start Scan" button. Now you can see a list contains camera roll, photo stream, photo library, contacts, messages, notes, reminders etc. 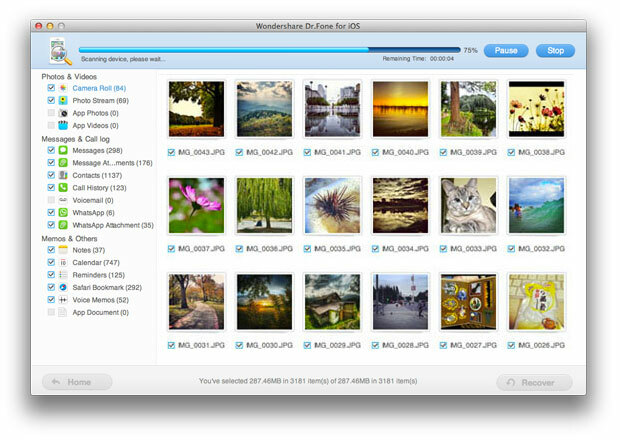 what you need to do is simply to click the lost photos, select, confirm and recover. 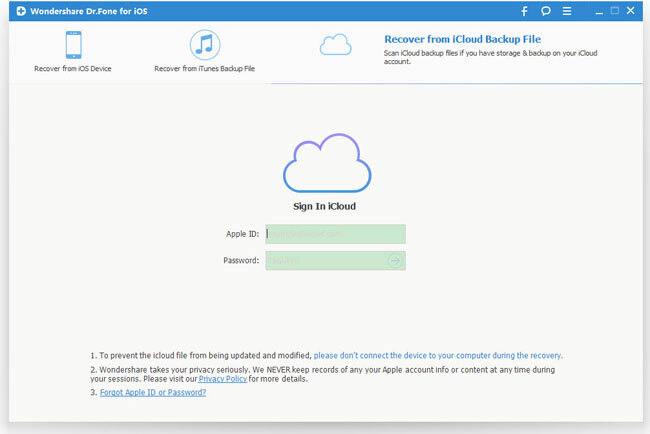 After launching the iPad Data Recovery, choose "Recover from iCloud Backup File" mode, and sign in your iCloud account. 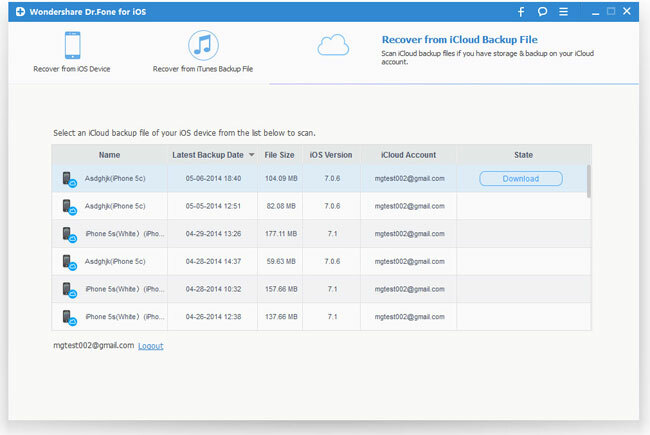 You will then be provided the backup files of your iCloud backup account automatically. Choose the backup you want to recover by clicking "Download" button. 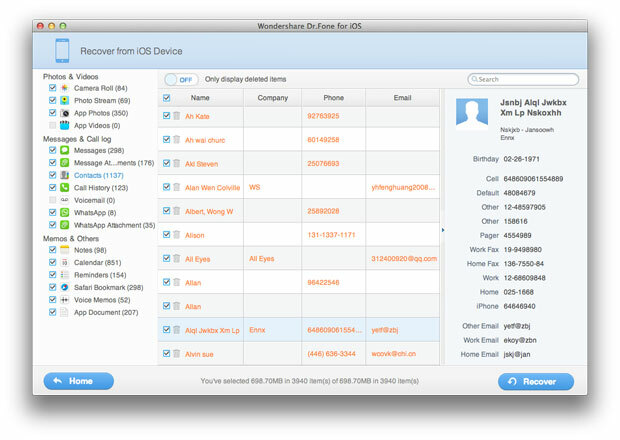 You can now preview the lost data files, such as photos, messages, contacts, notes, videos, etc. Choose the photos you need to restore by ticking them and recover by clicking "Recover" button here. That's all 3 solutions to recover lost photos from your iPad with iPad Data Recovery. Last but not least, to avoid losing the iPad pictures again in the future, remember to backup your iPad occasionally. iPad Data Recovery specializes in recovering lost data, such as photos, music, contacts, SMS, videos, notes, voice memos, bookmarks, App data of iPad Air, iPad Mini, iPad Mini with Retina Display, New iPad, iPad with Retina Display, iPad 2 and iPad 1 for all iPad users in seconds. 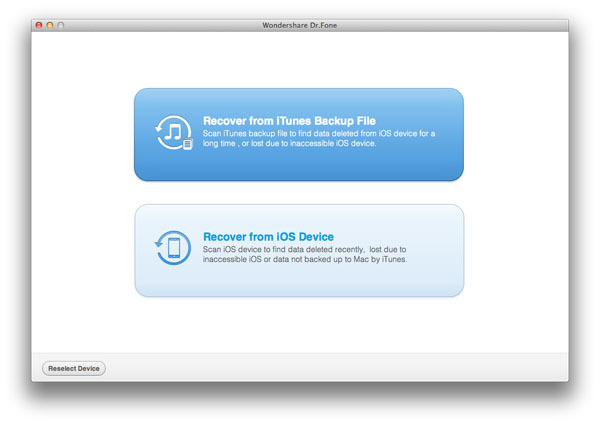 It's your best assistant to recover deleted or lost iPad data files.